Jaime Costiglio gives the Christmas tree skirt a fun twist by showing how to create a Christmas tree train track skirt. Check out this holiday DIY tutorial to see how you can do the same this holiday season. This Martha Stewart Living Christmas tree alone is quite a wonder to behold, but creating a touch of magic under the tree adds another level of excitement and surprise. 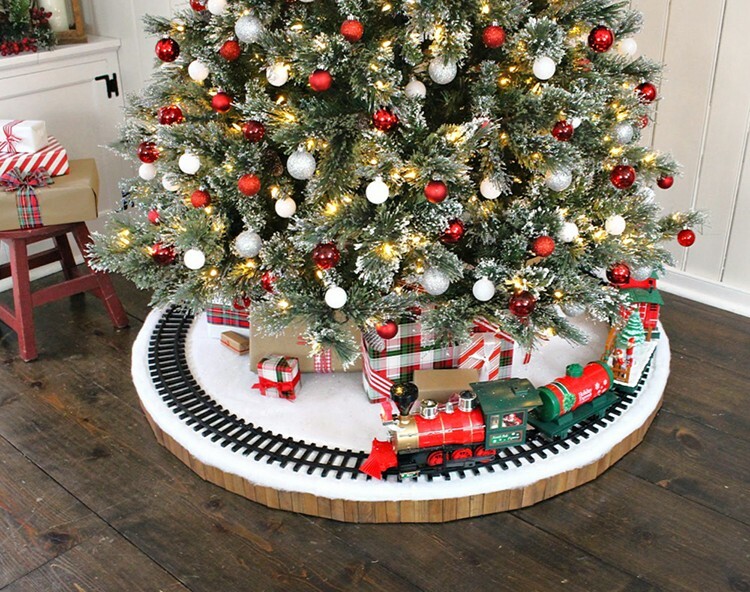 This Christmas tree train track tree skirt provides a secure, steady platform for the train and still allows plenty of space for gifts. Everyone dreams of the classic Christmas tree with the toy train chugging along under the tree bursting out with carols. 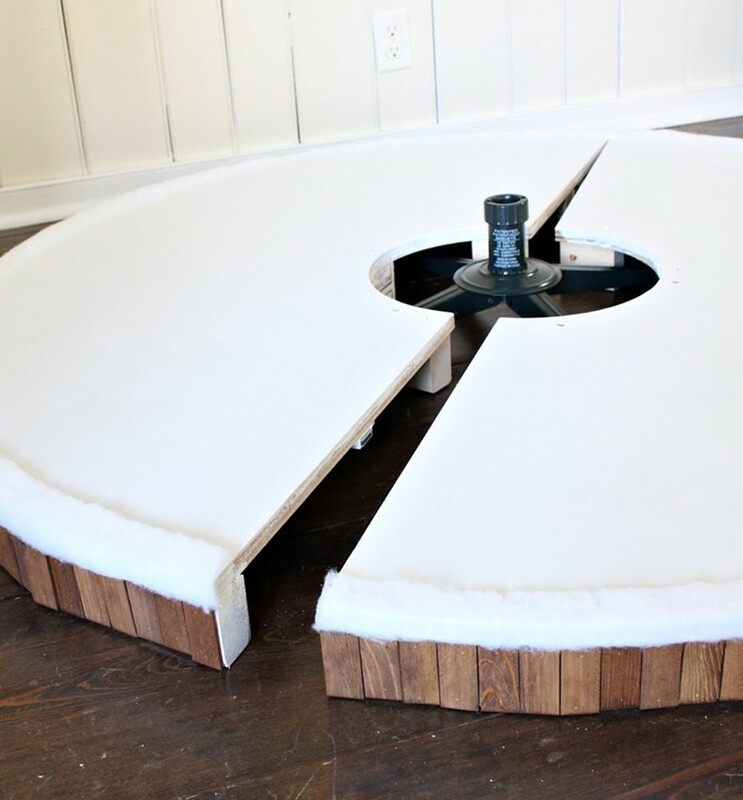 This elevated tree skirt keeps the track safe off the floor and provides a beautiful snowy scene to complete your tree. 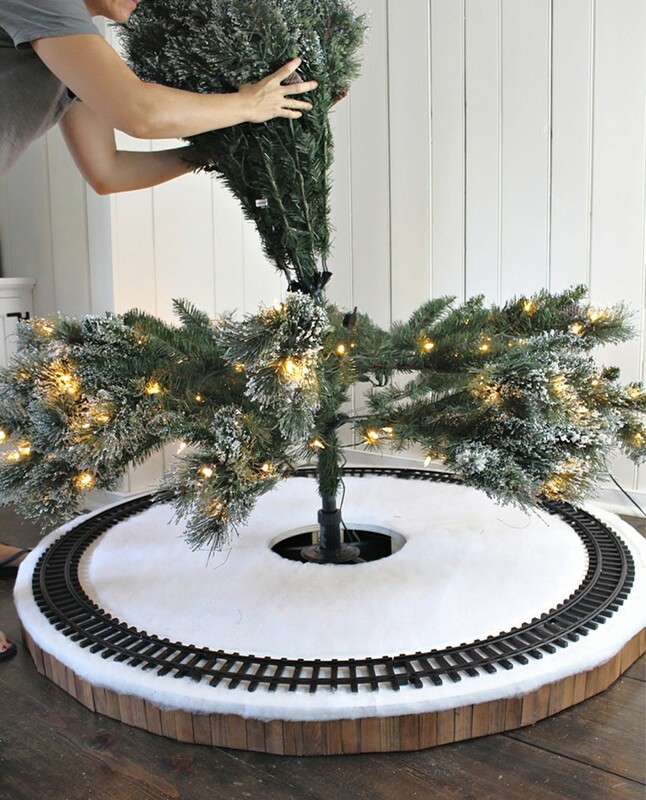 Imagine the children’s eyes when they see your Christmas tree all set up with this fun train track tree skirt below. This is a project you can make for your family that will provide years of magical moments to come. 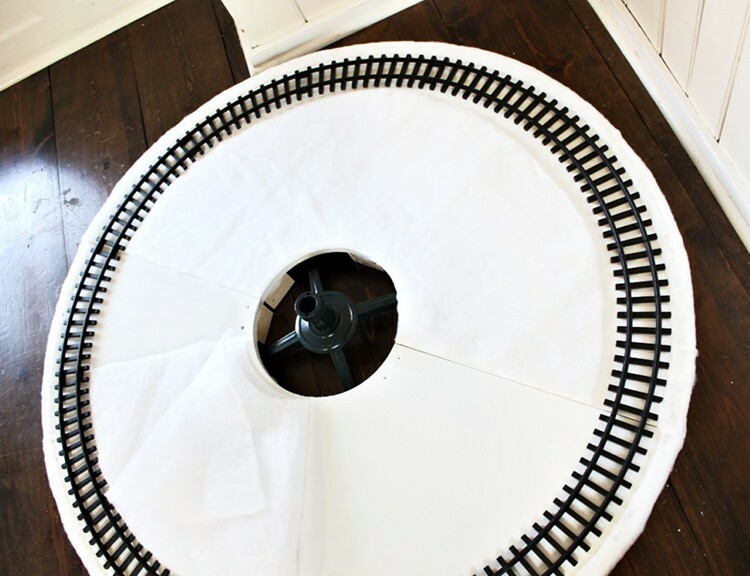 Below you will find the step by step instructions to create this train track tree skirt. Please read through the steps entirely before beginning and always follow all safety precautions when using power tools. 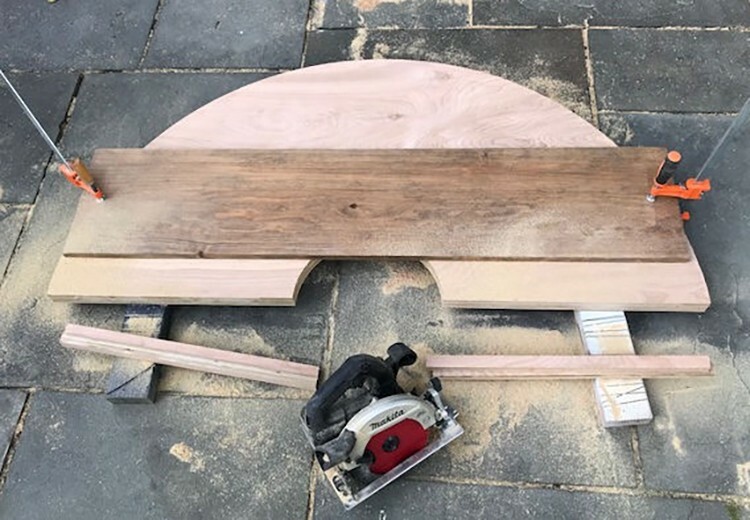 Use a router or jigsaw to cut a 27-in. half circle from ¾-in. plywood. 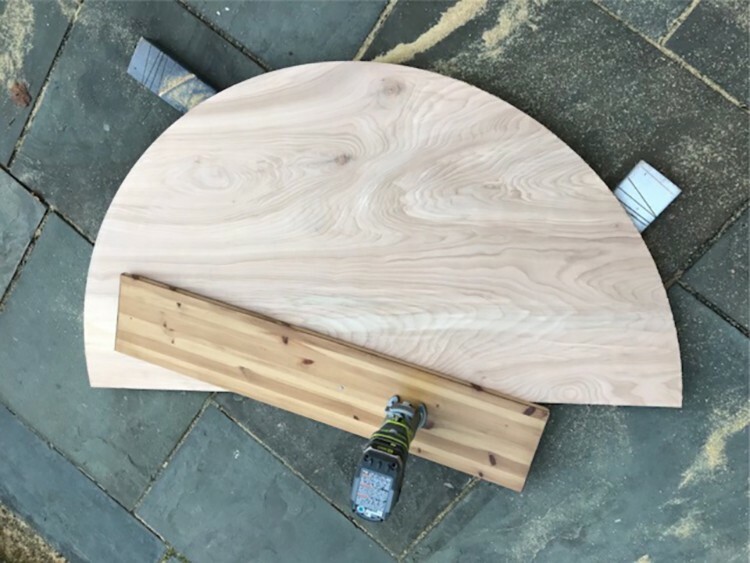 If using a router, mark the plywood 1 in. from long side, 28 in. from short side. Make a hole for the nail. Then, create a circle jig and place the nail into the hole. Next, swivel the jig around nail. Once the large 27-in. 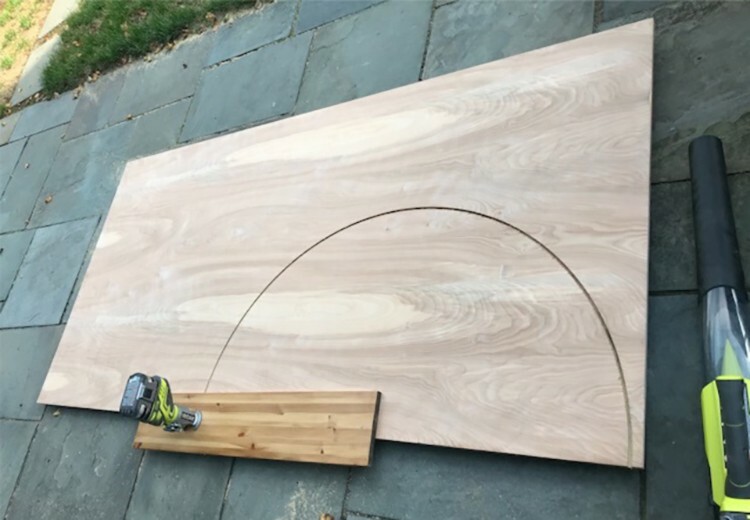 radius circle is cut, make a new nail hole in the circle jig for your 6-in. radius circle. 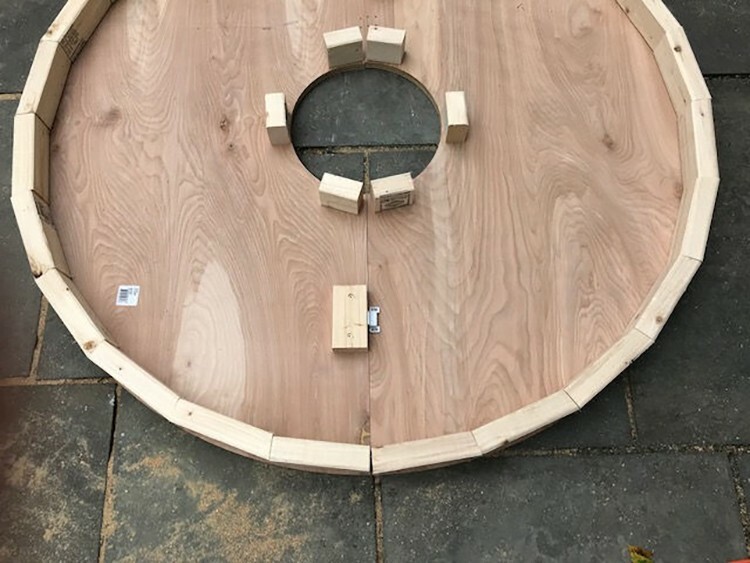 After both half circle shapes are cut, trim off the excess 1 in. using a miter saw and guide. Next, cut the apron supports and lay them out to ensure proper spacing. Notice that one end of the apron supports is square and the other is cut at a 15° miter. Then, attach the apron pieces to underside of plywood using wood glue, clamps and 2-in. countersunk wood screws. 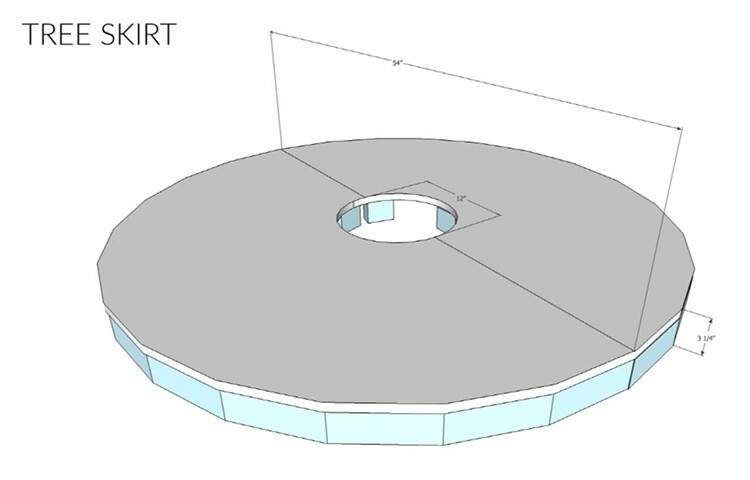 Attach interior supports at smaller radius. Keep in mind your tree support armature. Attach magnetic latches at seams to keep tree skirt together. Paint the platform and aprons white. 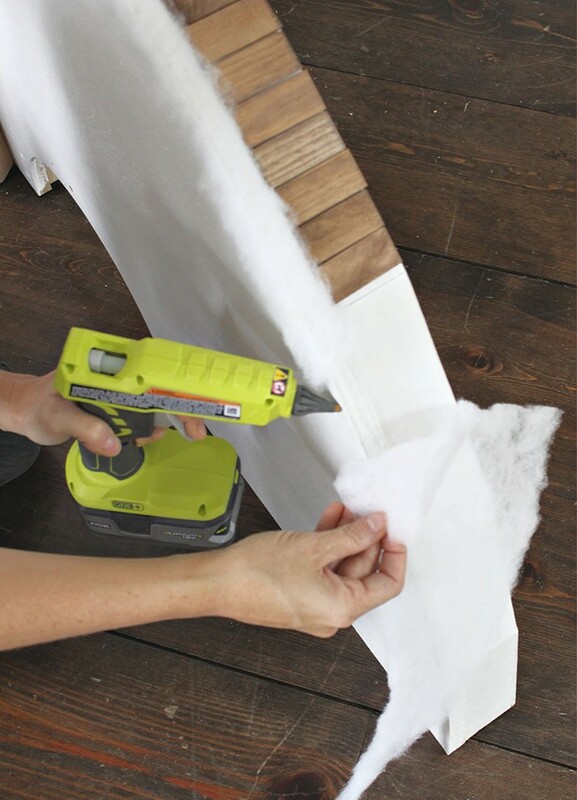 Attach faux snow to cut plywood edge using hot glue. 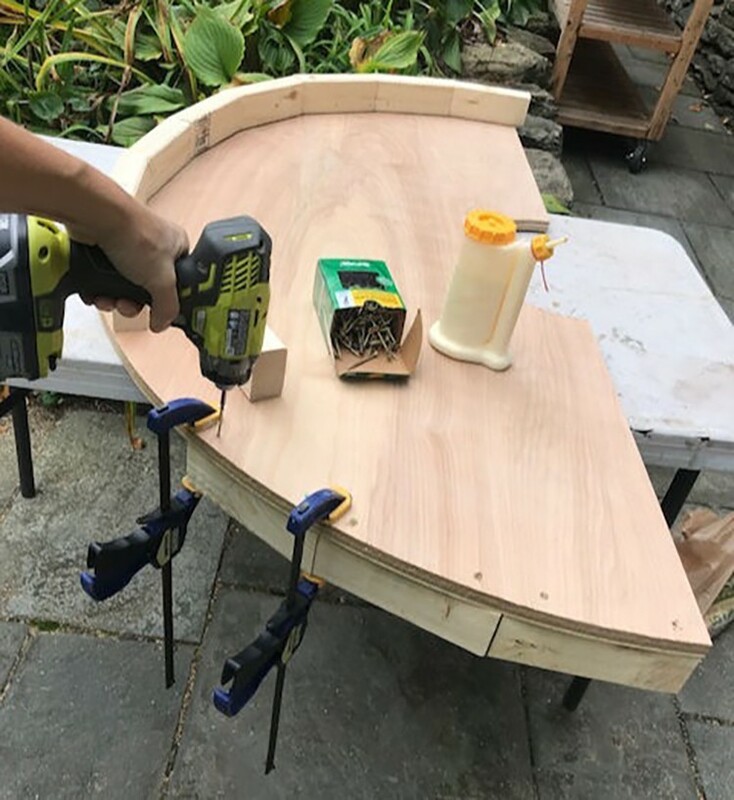 Wrap around raw plywood edge. 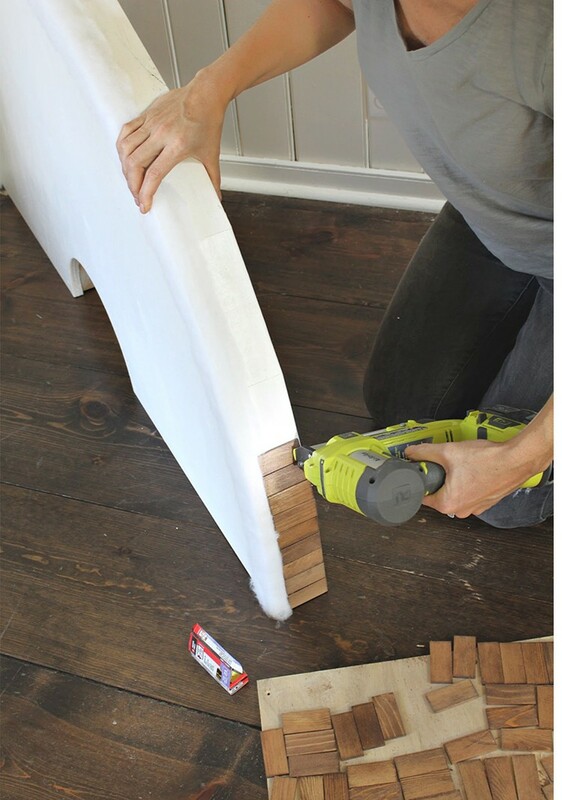 Apply stain to craft paint stick trim pieces and let dry. 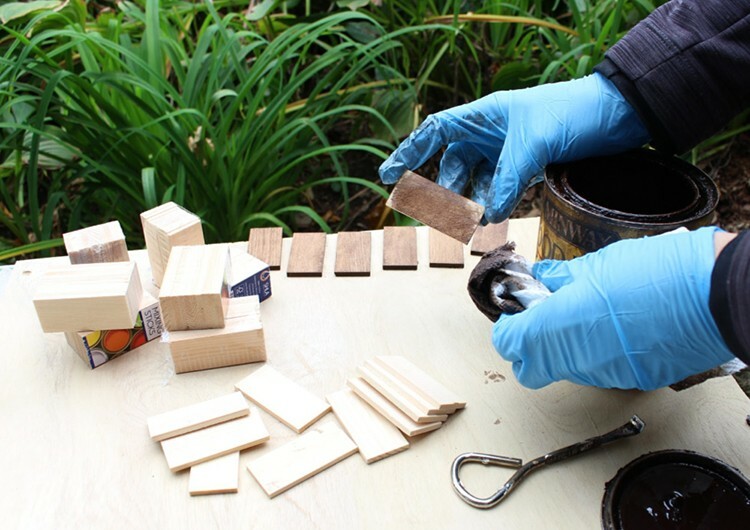 Attach trim pieces to aprons using wood glue and ¾-in. finish nails. Now your Christmas tree train track skirt is complete and ready to decorate. 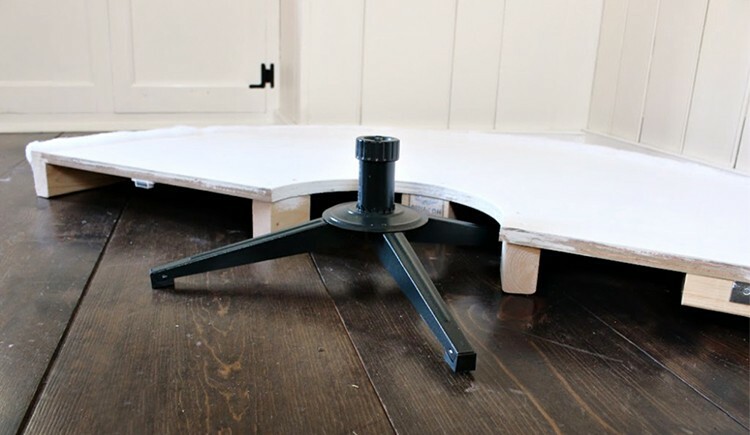 Place one half of the tree skirt in position and then slide the tree stand into position. Next, place the second half of the Christmas tree train skirt in position and push together until the magnets connect. 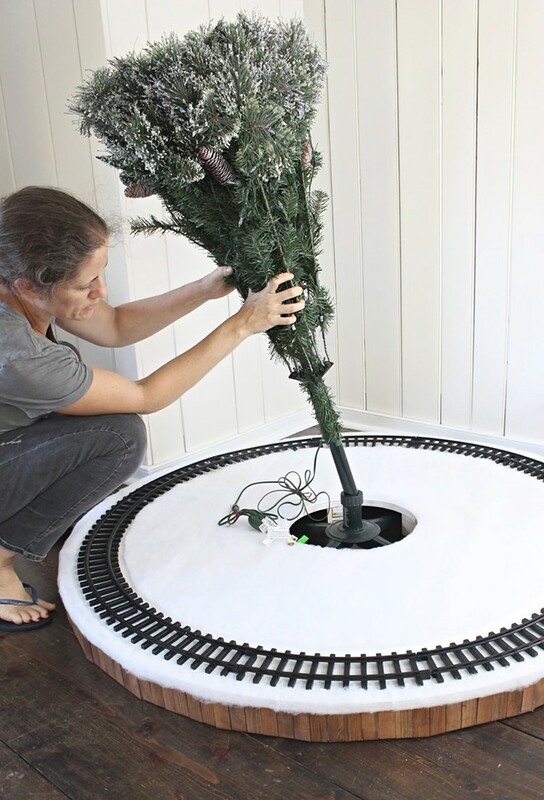 Place the train tracks in position and cut an inner portion of faux snow to fit just inside the tracks. Consider cutting two pieces with a center seam and attach to platform with hot glue if desired. Place the largest bottom portion of the tree into the base. Run the power cord under the tree skirt platform and plug in. 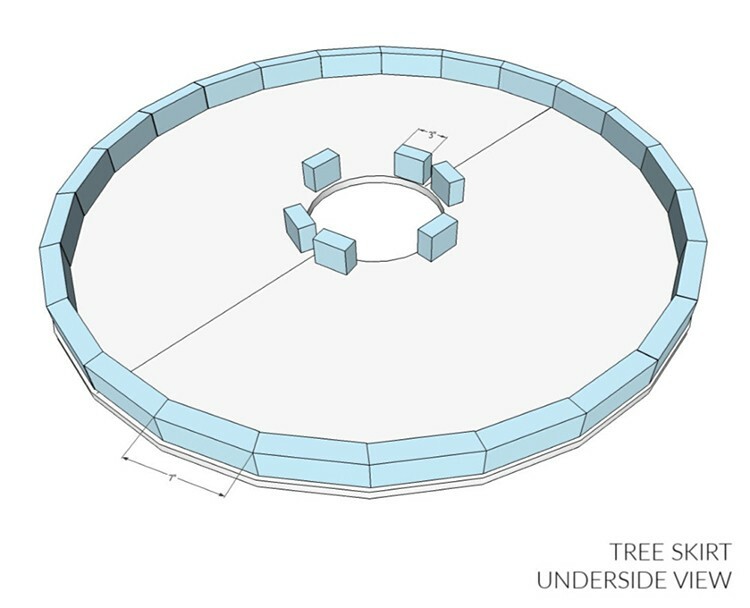 Complete the tree assembly by inserting additional tree sections. The tree lights up immediately once the sections connect. Once the tree is completely assembled it is time to fluff the branches to create fullness and a more realistic look. 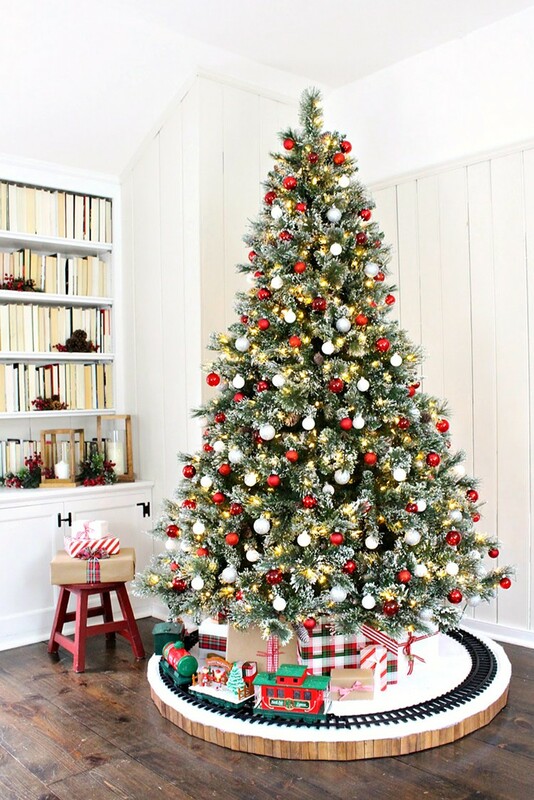 Add ornaments and decorations to fill up your tree. Place the train in position on the tracks and watch the children light up with delight! Find more Holiday ideas at the Home Depot Blog. Shop artificial trees at The Home Depot and make your own Christmas tree train track skirt. 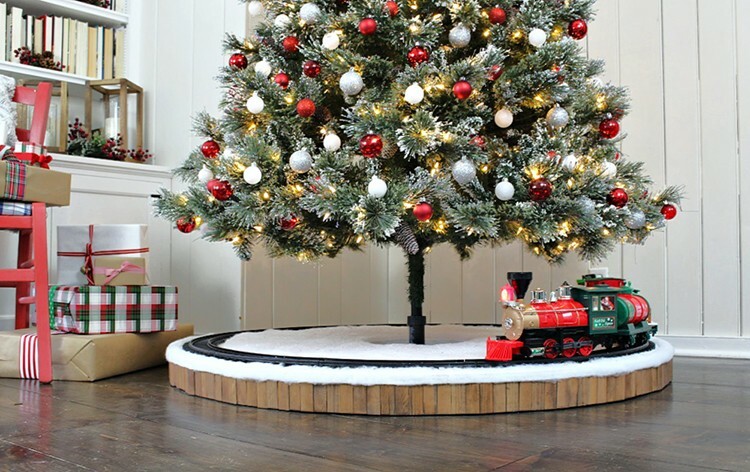 The post How to Make a Christmas Tree Train Track Skirt appeared first on The Home Depot Blog.